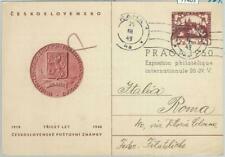 NICE CARD CANCELLED TEPLITZ-SCHONAU 8 NOV 1917 TO CONSTANTINOPLE. SOME WEAR AND AGING BUT NICER THAN USUAL. ((32Kc) - Jiri Stribrny. (37Kc) - Maxmilian Fatka. Sheetlet with 2 values (2v M/S) 3) Select each item and 'Add to Basket'. Pristine & Loaded Honduras nearly all mint Collection housed in a Scott Specialty album. 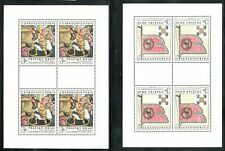 Loads of difficult to find sets, S/S, singles ranging from the 1800's to 1970's. Choice & undervalued. 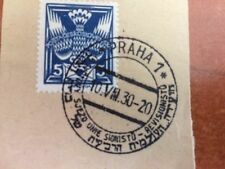 Scarce parcel card from Brno dated 14, July 1944 to an inmate at the Flossenburg Concentration camp. . 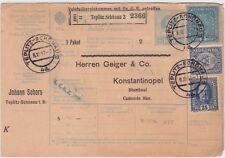 POSTAL HISTORY - Postal Stationery Card. The photos show the two piles of covers. 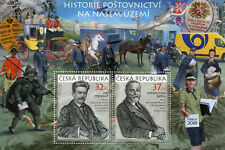 CZECHOSLOVAKIA. 1923. COVER. BRATISLAVA – BOHMISCHE KOMMERZIALBANK. Country : Czechoslovakia. Year : 1927. If you are looking for anything, any topical or country, let us know, we will make sure to let you know what else we have! Item : Cover. Country : Italy. Rest of the World - GBP 3,00. Year : 1929. If you are looking for anything, any topical or country, let us know, we will make sure to let you know what else we have! UPRATED CARD. 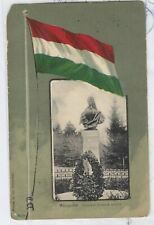 TPO 681 – PROSTEJOV TO TREBOVA. KORNITZ TO BERLIN. Priced individually. Lots & Collections. Large Souvenir Sheets. Italy, Czech Rep, ex-Yugoslavian republics. Republics . 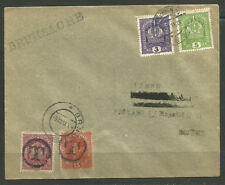 POSTAL HISTORY - FDC Cover. Country : Czechoslovakia. If you are looking for anything, any topical or country, let us know, we will make sure to let you know what else we have! Item : Maximum Card. Country : Czechoslovakia. Year : 1937. If you are looking for anything, any topical or country, let us know, we will make sure to let you know what else we have! Item : Maximum Card. Country : Czechoslovakia. Year : 1928. If you are looking for anything, any topical or country, let us know, we will make sure to let you know what else we have! Item : Maximum Card. (32Kc) - Jiri Stribrny. (37Kc) - Maxmilian Fatka. Set of 2 values (2v Set). 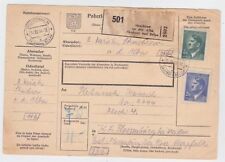 Czechoslovakia POSTAL HISTORY: MICHEL 67 BKZ on COVER - SCARCE! Country : Czechoslovakia. Rest of the World - GBP 5,00. Rest of the World - GBP 3,00. Item : Cover. We have been in the collectible bussiness for over 80 years! Country : Czechoslovakia. Year : 1968. Rest of the World - GBP 5,00. Rest of the World - GBP 3,00. Item : Cover. We have been in the collectible bussiness for over 80 years! Country : Czechoslovakia. Year : 1938. Item : Card. Rest of the World - GBP 3,00. - GBP 2,00. Country : Czechoslovakia. If you are looking for anything, any topical or country, let us know, we will make sure to let you know what else we have! Item : Cover. Country : Czechoslovakia. Year : 1940. We have been in the collectible bussiness for over 80 years! Rest of the World - GBP 4,50. Country : Czechoslovakia. Year : 1941. We have been in the collectible bussiness for over 80 years! Rest of the World - GBP 4,50. Year : 1863. Country : Austria. If you are looking for anything, any topical or country, let us know, we will make sure to let you know what else we have! Item : Cover. Country : Czechoslovakia. Year : 1942. Rest of the World - GBP 5,00. Rest of the World - GBP 3,00. Item : Cover. We have been in the collectible bussiness for over 80 years! Country : Austria. If you are looking for anything, any topical or country, let us know, we will make sure to let you know what else we have! 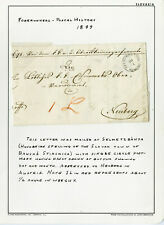 POSTAL HISTORY - Parcel form cut-out. Country : Czechoslovakia. If you are looking for anything, any topical or country, let us know, we will make sure to let you know what else we have! Country : Bohemia & Moravia. Year : 1943. If you are looking for anything, any topical or country, let us know, we will make sure to let you know what else we have! Item : Oversised Cover. Country : Czechoslovakia. Year : 1930. We have been in the collectible bussiness for over 80 years!